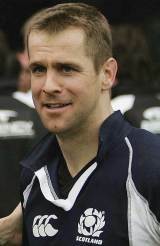 Chris Paterson was a stalwart of the Scottish side for more than a decade in a variety of positions, winning 109 caps and becoming for a time the most prolific points-scorer in international rugby. In one remarkable ten-month period in 2007-08 he kicked 36 consecutive goals for Scotland, , not missing a single attempt during the 2007 Rugby World Cup or the 2008 Six Nations Championship. When he quit in 2011 he was his country's leading points scorer (809) and most-capped player (109). His contribution was been much more than that purely associated with a prolific goal-kicker. He was third on the list of Scotland's try-scorers, and provided rare moments of flair and guile in an era where the Scottish back line was increasingly pedestrian. Despite Scotland winning most matches when he lines up on the left wing (11 from 25 appearances), he strung his most consistent displays together at full-back. A product of Galashiels Academy, Paterson made his debut in senior club rugby as an 18-year-old in 1996, playing all his club rugby in his native country until 2007 when he opted to join Gloucester for an unsuccessful one-season foray. Fittingly, he returned home and finished his career in Edinburgh.